I'd like to share my audition project for So You Think You're Crafty with you. That's right, I'm competing in Season 13 of the weekly crafting competition. The actual competition starts on September 10, so be sure to check in each week and vote for your favorite project. I decided that it was time to whip our guest bedroom into shape. We hadn't really done anything in there since we moved in. It was acting as a holding ground for some furniture and other junk that didn't have a permanent home yet. We had a queen mattress, box springs, and basic bed frame, so I decided to start with that. 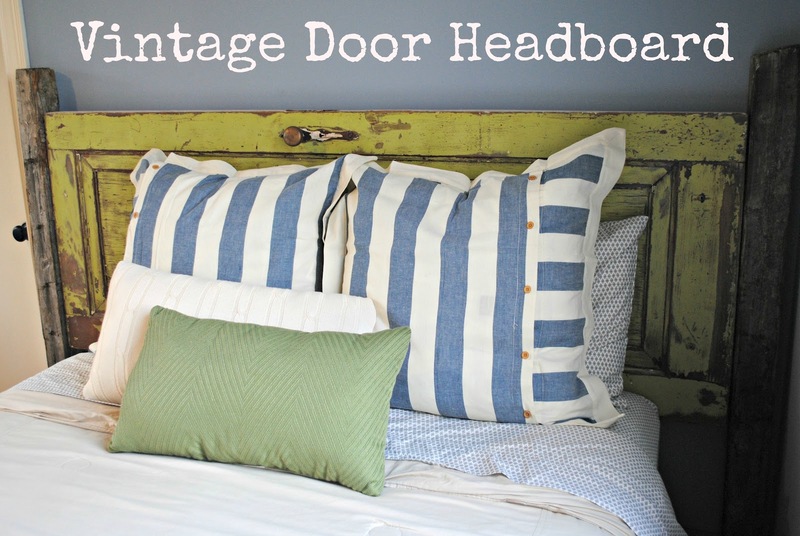 We needed a fun headboard to set the tone for the room. 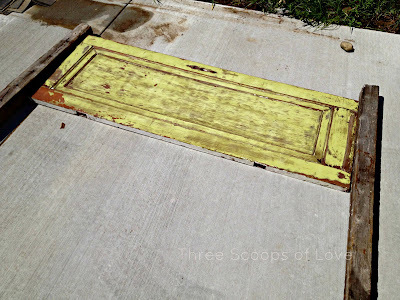 About two years ago, I ran across a Craigslist ad for a bunch of old doors. The seller was asking $100, but there were about 40 doors. Somehow, I convinced my husband that this was a good idea and he and my father in law drove a truck and trailer a hour away to pick up my treasures. My LARGE stash of doors has been sitting in my parents' barn ever since. I've used a couple of the doors here and there, but there are many projects still waiting to happen. That winter (see the snow? ), it was starting to warm up and I was getting the itch to get outside and work on a project, so I started scraping the white paint off of this door. I stuck it back in the barn and let it sit until now. 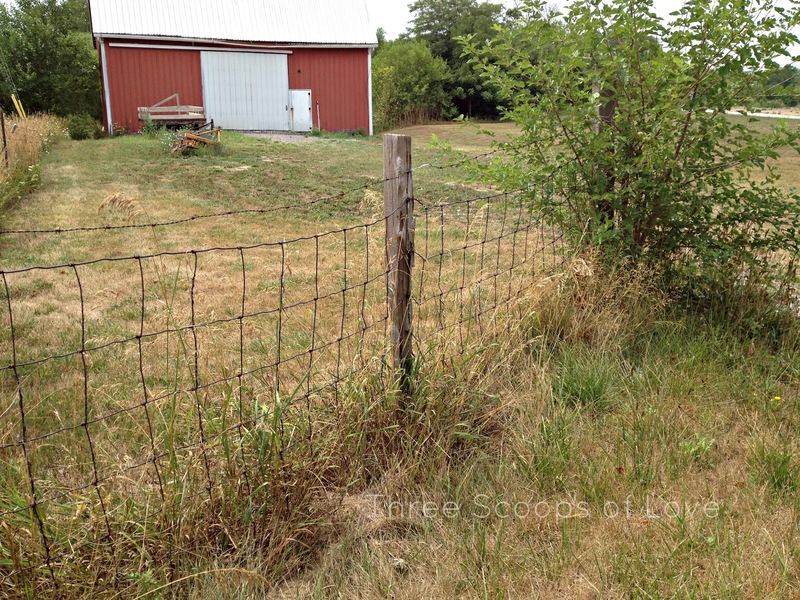 Then a couple of months ago, my father in law tore out this old fence row. 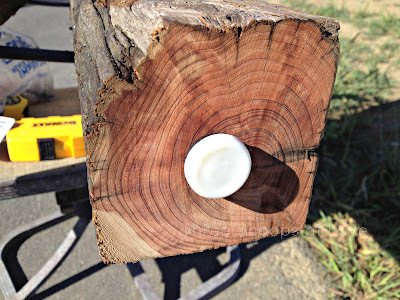 When I started thinking about some kind of posts for my headboard, he scavenged a couple of the posts out of his trash pile for me. I cleaned up my door and removed any loose paint that was peeling off. 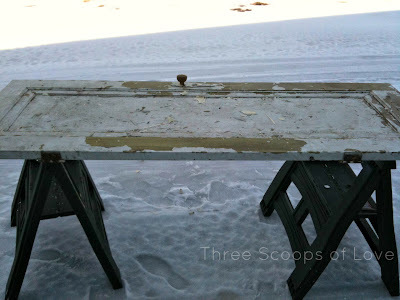 I gave it all a rough sanding, just to get any grimy parts off. I removed the hardware to clean it and sealed the whole door with clear acrylic spray, to keep everything in place. Then, I started laying out the posts to see where I wanted everything. 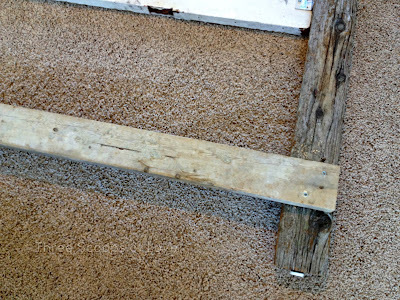 After I got all my measurements down, I cut the posts to length and added a plastic nail-on furniture foot, just to keep it up off the carpet a little. 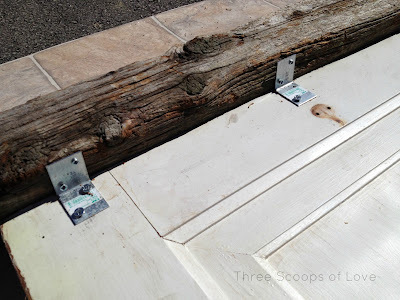 I flipped the door over and used some metal brackets to screw the door headboard into the posts. I set up my bed frame and got it ready for the headboard. 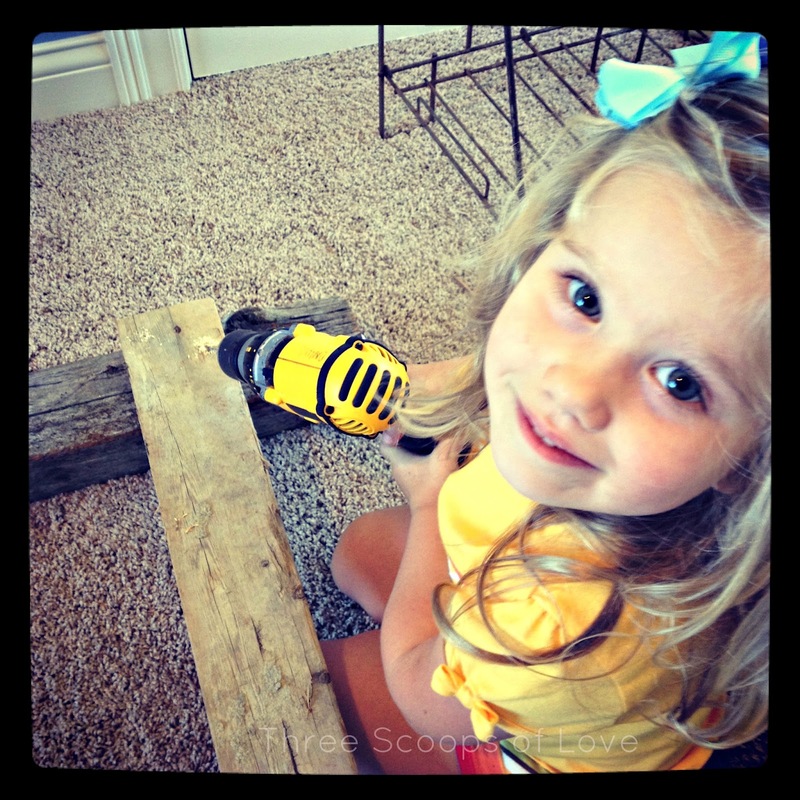 With her help, I attached a scrap board towards the bottom of the posts. 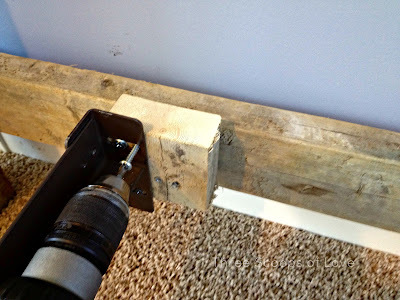 My headboard was going to be wider than my bed frame, so I needed a place to attach the frame. I cut some blocks of wood to act as spacers and then screwed the frame into the board. I added those blocks because I didn't want the frame and mattress to be too far under the door. I was worried about my guests banging their heads on the headboard. 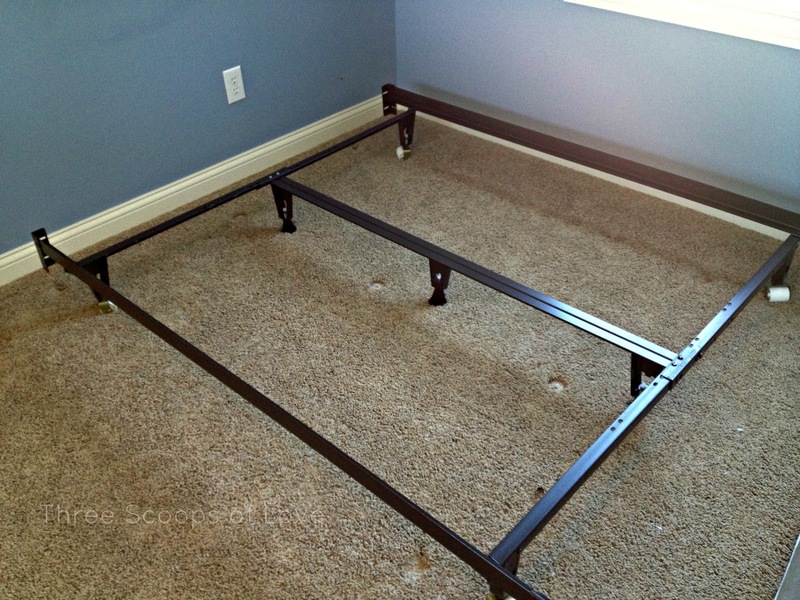 Here she is, all ready to have the box springs and mattress put into place. 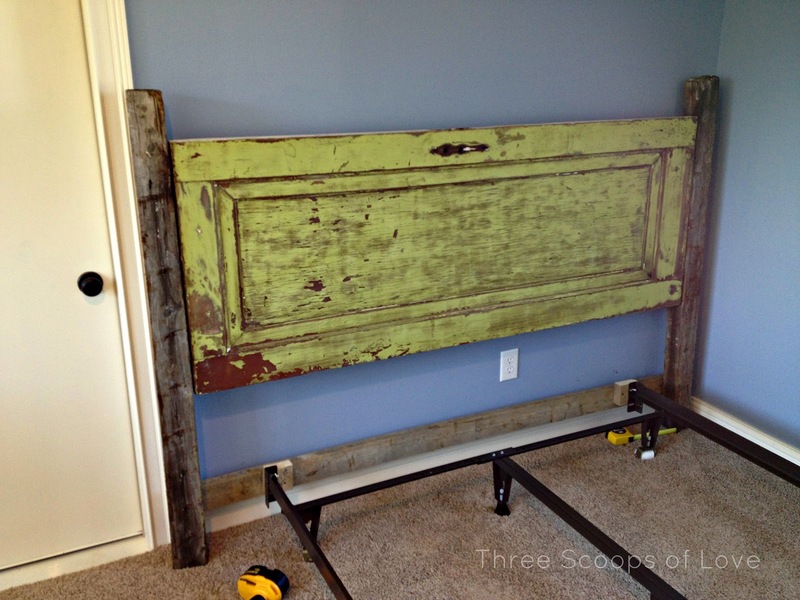 Once it was all put together and the bed was made, I loved the bright pop of green even more. The character of the door definitely shines through and I love that the fence posts found a new life instead of just going in the trash. It's time to invite some out-of-town friends over! This bed needs some weekend visitors! I've linked up to these linky parties! Go check them out! 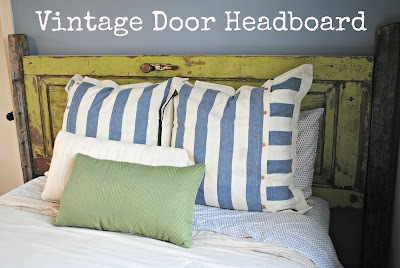 Love your door headboard, what a great repurpose! Oh, I love it! The vintage look is awesome in that room:) Found you on SYTYC! Good luck with the contest and have a great week! Looks so cool! Great idea! I'm buying a vintage door this week and am going to try this for our guest bedroom. I was worried when the door was longer (taller) than the bed is wide, but I see from your example that it will work anyway. Thanks for sharing! I am wondering if there is a lot of strain on the headboard where it attaches to the frame? Does it lean up against the wall or do you put it real close so it won't break the wood the frame is attached to?